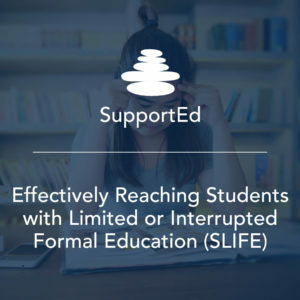 Join a supportive cohort of teachers and administrators as we delve into the specific strengths and challenges of students with limited or interrupted formal education (SLIFE) in this six-week guided online course. Over the three self-paced components, you will delve more deeply into SLIFE topics including supporting and engaging SLIFE and their families; developing of materials, activities, and programs; and effectively instructing SLIFE. Like our other courses, the heart of this course is a Professional Learning Community-based discussion. You’ll have the opportunity to share your expertise with your colleagues as well as provide and receive feedback. At the end of the course, you will have a SLIFE-specific plan for instruction and/or a plan for a SLIFE program, depending on your educational role. We look forward to working with you to fill your toolbox with useful strategies for supporting SLIFE and to build a network of support.